PERRY – About 200 people attended the Perry Government Forum Nov. 14 at Manchester West to be updated about what was happening with the Perry Nuclear Power Plant, which is currently scheduled to be shut down in May 2021. The speakers for the evening were: Wendy Zele, regional external affairs with FirstEnergy; Dave Hamilton, site vice president of the Perry Plant; Jack Thompson, superintendent of Perry Schools; and Ben Frech, Ohio Clean Energy Jobs Alliance. • Wendy Zele stated FirstEnergy Solutions had filed for bankruptcy in March 2018 for its generating units. The restructuring agreement with major financial stakeholders, large creditors and the official committee of unsecured creditors could be finalized in a month or so. Senate President Larry Obhof and Speaker of the House Larry Householder have been to the Perry Nuclear Power Plant. Efforts to have new legislation introduced soon to the Ohio House and Senate continue. Zele said Davis-Bessie was scheduled for shutdown in May 2020 and Perry in May 2021. For that reason, it was especially important for regional officials, community leaders and voters, to urge legislators to pass legislation. The two plants account for 90 percent of the state’s clean air emissions electricity. Vendors and suppliers around the whole state earn revenue totaling about $45 million each year doing business with FES. The two plants pay more than $30 million each year in state and local taxes, which benefit, among others, Perry schools, Lakeland Community College, Auburn Career Center, as well as police, fire and other first responders. The two nuclear plants generate 14 percent of the state’s electricity. Since Ohio already has to purchase about 11 percent of its needed power, their closures would increase that deficit. Zele concluded by noting if Ohio goes to one energy source, gas and electric prices will rise. There will also be the cost for new infrastructure needed to bring power from the gas plants to northern Ohio. • Dave Hamilton said the PNPP has begun preparations for its three- to four-week shutdown to refuel in March. During that time there will be another 1,300 to 1,500 supplemental employees joining the current 700. Most of the additional workers will be booking hotel rooms and eating at local restaurants. This happens every two years, so this is the last one planned, unless things change and the plant remains open. 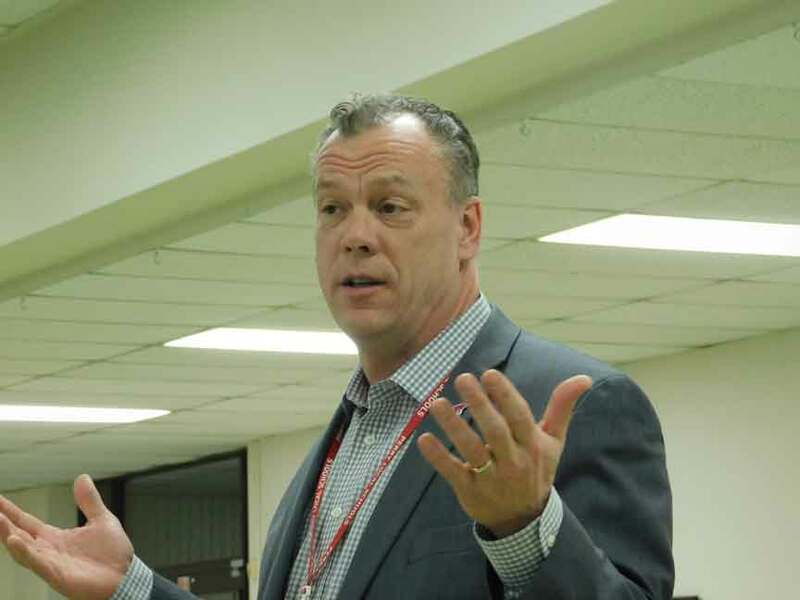 Davis-Besse has no more planned since it was refueled in 2018. The employees at the plant are highly educated and/or highly skilled and well-paid, he said, so their jobs and the taxes they pay will not be replaceable in the area. About 500 employees live in Lake County and most of the rest are from Ashtabula and Geauga counties. Besides the taxes employees pay, they contributed about $100,000 and about 900 pounds of food in 2018 to United Way. Participation in Salvation Army’s Adopt a Family provided gifts for about 25 children, not to mention hours donated to charitable organizations. Hamilton said FES had to file for bankruptcy because they could not generate enough revenue. “If we’re able to do a couple of things and get some uplift from the state, or some help with changing market conditions or program reforms, we’ll find that we’ll be able to rescind those deactivation notices and the valuation of the plant will be taken a look at again,” he said. The PNPP’s current operating license is good until 2026, and the expected life of the plant is 80 years. • Jack Thompson said the school district’s fine facilities were due, in large part, to the Perry plant, along with excellent educational programs. However, he noted, the schools and communities have lost millions of dollars in tax revenues due to the devaluations of the plant over the years. He said state Senator John Eklund, who sponsored the zero emissions credit legislation previously, would continue to work on the issue, and newly elected state Representative Jamie Callender was also responsive. Thompson said there are many things children should not have to worry about. “So why would we take power plants that are currently producing zero- emission energy and replace them with other power plants that are going to further pollute our air that our children are going to be (breathing)?” he said. • Ben Frech said the only goal of the Ohio Clean Energy Jobs Alliance is to get legislation, to be proposed soon, passed within a few months. However, in order to get the legislation passed to keep the plants open, they need support from all over the state. He asked those present to fill out forms to become public supporters of Ohio’s nuclear plants and receive information on how things are progressing. The cards also suggest volunteer activities such as contacting officials, posting on social media, asking people to support nuclear power, sending letters to newspapers, and more. Frech said it was especially important to recruit support from friends and family in other parts of the state. See the website at www.protectohiocleanenergyjobs.org for more information. The speakers then fielded various questions from the audience. Zele told the first person there was a big push to get legislation passed by June because Davis-Besse was scheduled to close next spring. Although the bankruptcy process is uncertain, Hamilton said the investors seemed to be showing interest in operating the plants. The issue of deregulation came up and Hamilton said all the nuclear plants that have been closed were in deregulated states, like Ohio. In regulated states the nuclear plants were okay. He later stated the Perry plant had its most efficient operations ever in 2018. One person said he had thought the Perry plant needed to close because of the condition of the plant. Hamilton confirmed the plant could be operational for about 80 years. (It celebrated 30 years in 2017.) The reason for closing is strictly economic. Questions came up about the legislation. Hamilton noted wind and solar power get credits. Some states which passed legislation added an extra charge to customers, while other states levied fines for emissions and used that money to credit the emission-free nuclear plants. While a coal or gas plant could be closed for a few years and restarted, that cannot be done with a nuclear plant. A person asked what was being done to cut expenses. Hamilton said they have renegotiated some contracts through the bankruptcy and some jobs have already been cut. The speakers repeated that there was a cost of doing nothing to save the plants. For example, if nuclear power is eliminated, natural gas will have no competition, so their prices will go up. A study by Navigant estimates the plant closings would increase electric costs for residents about $35 each year from 2022 to 2029 and increasing to up to $68 a year by 2029.